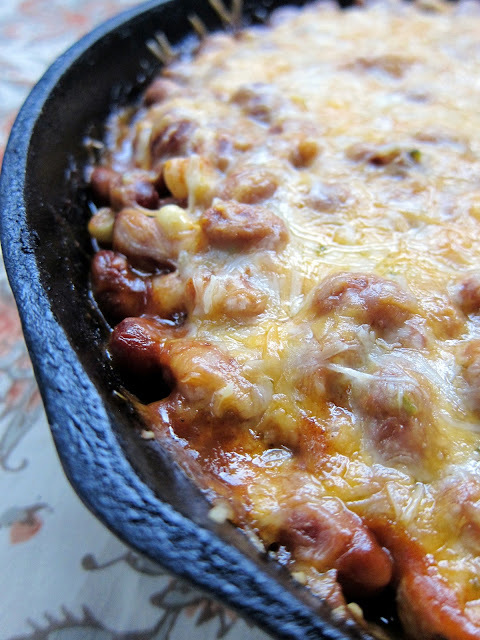 A friend of mine sent me this Quick Tamale Pie recipe. It was so different than any of the other Mexican casseroles that I've made. I had a roll of polenta in the pantry, so I decided to give it a try! This was super fast and delicious! It took longer for the oven to preheat than it did to throw this together. I added chicken, but you could leave it out and make this a vegetarian dish. We both really enjoyed this. It was a nice change to Mexican night! In a large bowl combine the chicken strips, corn kernels, salsa, chili beans (and their juice—just dump the can in) and spices. Stir well to combine. What a great recipe Steph! a flash. It looks yummy too! Polenta is something I've never had. But, that casserole sure looks wonderful. I love the idea of using polenta for this yummy casserole. I'm going to try it using a light Mexican blend of cheese and reduced-fat sour cream. Can't wait to try this!! Tomorrow for sure soon as I can get out and get the polenta. Thank you. first of all, love the fall all over your blog. sorry i haven't commented as of late- i have been following! i have just been too busy to comment and share my appreciation as a fan. secondly, what a GREAT recipe! so easy and such pop. cannot wait to try this myself. This looks fantastic. Can you imagine fueling up on this before trick-or-treating? This looks great. I love all your recipes. We should have a Birmingham/Alabama blogger get together! That is different than the usual cornbread or bisquick style pies. I like it. Thanks for sharing this looks delicious! Are the 'southwest chicken strips' precooked? Seems like 30 minutes of cooking time isn't enough for raw chicken. John - yes, the chicken is pre-cooked. Enjoy!